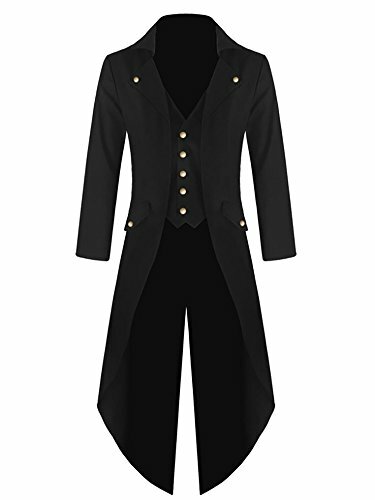 Mens black tailcoat style jacket, with unique cutaway front which gives the appearance of a vest being worn beneath the coat. Fastening at the front with 5 snap fastenings, with classic notched lapels featuring decorative snaps, and long pointed split tail to the rear. Occasions: Good Choice for Halloween, Comic Con, Cosplay Shows, Party, Nightclub Fashion Show, Photo Shoot, Collection, etc. Material: 100% Polyester, comfortable and durable to wear. Fits: Please choose according to the size chart we attached. Features: swallow tail, combined 5 snap on waistcoat, and a large high collar. Occasions: Good choice for Halloween, Comic Con, cosplay, photoshoot, etc. Including: One steampunk tuxedo jacket.